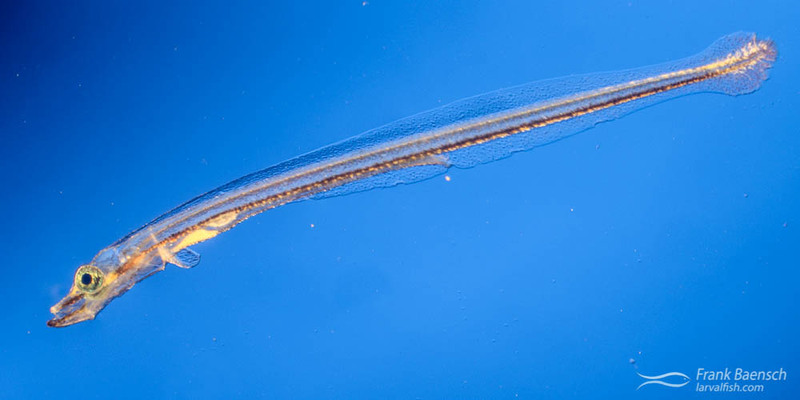 Smooth cornetfish (Fistularia commersonii) larvae were raised from wild-spawned eggs at 77-79F on wild copepods and artemia. The larval duration was 55 days. First record of Cornetfish culture. The cornetfishes are a small family (Fistulariidae) of medium to large sized fishes with an extremely elongated and slightly depressed body and a prolonged and tubular snout. The family consists of just a single genus, with four species, found worldwide in tropical and subtropical marine environments. Cornetfish attain a maximum of 6 feet in length and feed on small fishes in open coastal waters or on coral reefs. They are one of the only known predators of the Red Lionfish (P. volitans) and the Common Lionfish (P. miles) in the Indo-Pacific, which have become significant invasive species off the East Coast of the United States and in the Caribbean. Cornetfishes have limited economic importance as food fish. Adult Smooth Cornetfish (Fistularia commersonii) on a reef in Hawaii. Smooth Cornetfish (Fistularia commersonii) juveniles were cultured from eggs numerous times for this project. F. commersonii eggs were collected in neuston tows throughout the year but are most abundant during the warmer months. The eggs are round and relatively large, measuring about 1.8 mm in diameter. Incubation time is about 4 days at 27C. Smooth Cornetfish (Fistularia commersonii) larvae reared in the laboratory. The larvae are long, measuring a whopping 7.5 mm TL at hatching. They begin to feed by 3 dph, exhibiting an “S–flex” behavior upon encountering prey. Flexion occurs at 15-18 mm TL (12-18 dph). Postflexion larvae grow fast reaching 60 mm TL by 30 dph. F. commersonii larvae begin to settle near 100 mm TL, 50 dph. Specialized features for pelagic life include head spination and large body spines. F. commersonii larvae are not easy to culture because they are prone to swim bladder hyper-inflation and are often trapped above the water along the tank sides. They were reared on a mix of adult copepods and artemia.